Hold Z to issue orders to the crew. Crew Orders are designed to be a quick way to relay crucial information to the entire ship. The Captain has the ability to change the order, and once an order is changed, everyone is notified via a text effect on the top of the screen. The order will slowly fade from view. The Comms Screens allow the player to view other vessels within sensor range and potentially communicate with them. Other vessels could hail your ship, or vice versa. Initiate communications through the main Comms screen in the Scientist’s station. Two additional screens will appear on the bridge if communication has been made. The Captain makes the final dialogue decision during a hail, but crewmembers may vote on different options to help the Captain choose the best approach. Based on the other vessel and the chosen dialogue, your crew may be able to open a trade. You can open a dialogue with another ship, or another ship may open one with you when entering a new sector. Depending on the other ship’s faction, your faction, and your location in the galaxy, a ship may or may not be hostile towards you. If a ship is friendly towards you, you can speak with them and trade goods (trading is not currently implemented). A daring or desperate Captain can also attempt to extort credits or fuel from a friendly ship through intimidation. If a ship is hostile towards you, they may start a dialogue warning you to leave the sector or perhaps attempting to extort money from your ship. In these events, the Captain has the options to comply with their demands, attempt to use diplomatic routes to prevent a battle from occurring, or initiate combat. Many hostile ships are impatient, and decisions on how to interact with them need to be made promptly or they will simply attack after a time. Diplomacy options have an ‘investigate’ feature which allows you to probe how effective a specific option might be towards the hostile ship. With each successful investigation attempt, a percent will be revealed, demonstrating how likely the ship is to accept a particular diplomatic option. However, the more you investigate these options, the greater the chance that the hostile ship will lose patience and initiate combat. Diplomacy and intimidation can be increased and improved by selecting particular starting ships, equipping special ship components or investing in the Diplomacy and Intimidation talents. 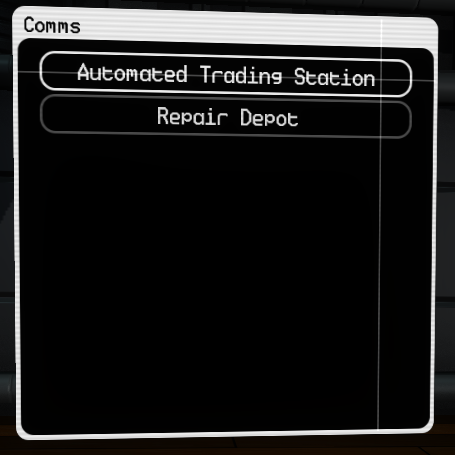 The Trading Menu can be accessed through the second of the initiated comms screens. When initiating trade, the menu will display items pertinent to your ship. Such things include ship components, missiles, coolant and fuel. Hovering over an item will display its description and other important information. From the top of the trade menu, players can choose to display items that are being sold through the “BUY” tab. They can also choose to display items in their cargo bay to sell through the “SELL” tab. If you have a component of the same type currently installed on the ship, you may use the ‘Swap’ function. Swapping a component allows you to trade a currently installed component and add its value to the transaction. The swap menu will display the different stats of each component for comparison. After the purchase, the new component will be installed in place of the old one.